Up to 7 feet (2 meters) of snow trapped the guests and staff at Montecito Sequoia Lodge in Kings Canyon National Park starting Sunday following a storm, U.S. Forest Service spokesman Alicia Embrey said. 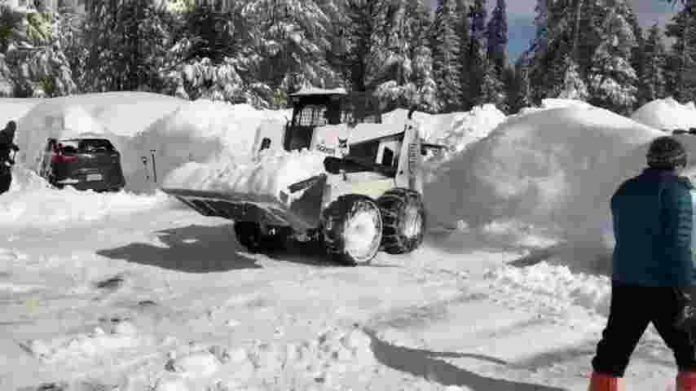 Crews had to travel by snowmobile to get to the lodge in the mountains east of Fresno on Wednesday morning, when they ensured everyone was safe. They returned Thursday with some additional supplies, she said. Though the people stuck at the lodge got bored during the snow-in, Embrey said the lodge had enough food, fuel and general supplies to keep everyone comfortable. Joel Keeler posted several videos of his experience at the lodge on Twitter starting Tuesday, when the snow was still coming down and guests learned they still weren’t going to be able to leave. “They are working hard to clear the road … Still a lot of driveway left tho!” he wrote. On Thursday, he posted that guests were finally going to go home, sharing video of the cleared roadway and a caravan of dozens of snow-capped vehicles snaking their way out next to towering walls of snow. The snow that trapped the guests began falling Friday, blanketing the area with between 4 to 7 feet (1 to 2 meters) of snow by Saturday night, Embrey said, adding that roads to the lodge were closed by Saturday afternoon.